The Salida Council for the Arts (SCFTA) invites the public to attend the monthly Creative Mixer at the Salida SteamPlant in the Paquette Gallery on Thursday, March 14 from 5:30-7:00 pm featuring artist Cody Oldham and musician Andrea Cohen. ABOUT CREATIVE MIXER: Held every second Thursday, the Creative Mixer is a free monthly public gathering of those interested in knowing more about the local arts scene in a casual social setting. Anyone with information to share about upcoming creative and art-related events is encouraged to give a brief announcement. Attendees are welcomed to introduce themselves and may find new friends and collaborators at the “Mixer.” Free hors’ de oeuvres, a cash bar, beautiful artwork, great conversation, and music are always in abundance. FEATURED ARTIST: Cody Oldham is a 15 year-old wildlife and landscape painter who has been painting four years. There is nothing else he’d rather do, each day beginning with gratitude to have the opportunity to learn more and express himself in his paintings. Cody paints for hours every day to improve, either in the studio or en plein air. He is always pushing myself harder and trying new things. He believes experimentation is learning. Living in the mountains of Colorado, Cody is surrounded by vast landscapes that are inspiring to him. From the leaf on a tree to a dramatic mountain scene, his environment motivates him in many different ways. Every time he looks at an animal’s face or into its eyes, he thinks of a new idea for a painting. Cody’s mentors and heroes are Robert Bateman, John Banovich, James Gurney and Andrew Tischler. All these artists have helped him progress quickly in his painting and career. His artist father is a huge influence, helping him fine-tune many aspects of his paintings. FEATURED MUSICIAN: Andrea Cohen started out studying classical viola at the age of 8. In her early teen years she was introduced to traditional music, and was hooked! On the inheritance of her grandfather’s fiddle, her days as a fiddle player began, and she has never looked back. 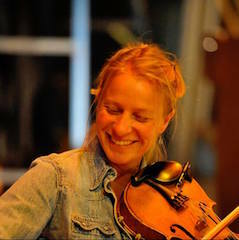 She has been playing traditional fiddle for over 30 years in contra dance and old time string bands, performing, teaching workshops and playing for dances throughout the US and internationally. Her love of traditional dance similarly began at a young age. She started attending contra and square dances about the same time she started fiddling, and those two passions have always remained intertwined. After being introduced to clogging, an Appalachian style of percussive dance, Andrea joined the MN-based Wild Goose Chase Cloggers, performing regionally and internationally for six years. Somewhere along the line, she also became a dance caller and now spends as much time calling dances as fiddling for them. Andrea's favorite traditional music styles include southern Appalachian old time, Irish, French Canadian, Cajun and Swedish. In addition to fiddle, Andrea plays clawhammer banjo, viola, feet (clogging) and sings with several different bands for dances and festivals, leads a monthly old time jam session, and teaches fiddle and viola. High School Scholarship Applications: Performing Arts & Visual Arts! APPLY NOW! Deadline April 30th!